Beavertail Lighthouse, Conanicut Island annual AARL Field Day with the team from Providence Radio Association, W1OP. 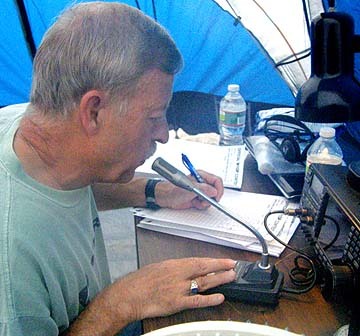 Cap'n Vic is proud to be a part of the Providence Radio Association's ARRL Field Day Team. For nearly 50 years many of these guys have participated in the annual Emergency Communications Preparedness Drill held once a year thoughout the US. While we we actually had a equal number of "youngsters" to balance out the program in 2010, participation was lighter in 2011. Dennis, K1LPX, joined Team W1OP 1986, but first FD elsewhere 1961. 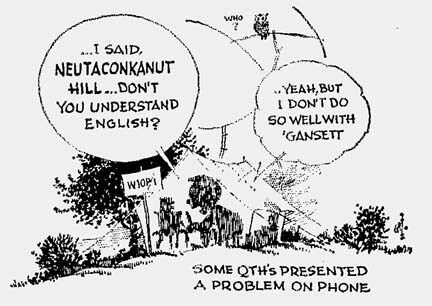 W1OP operated from Neutaconkanut Hill from before my first Field Day (1959) until circa 1964. From circa 1965-1968 we operated from the old FCC site (Suddard Farm) on Darby Rd in Scituate using their 70 to 90 foot telephone poles (guess who climbed them...). 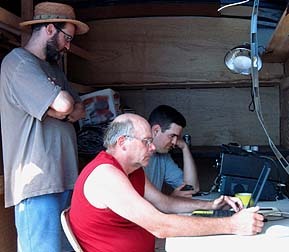 W1OP/1 finished #1 in the 4A category from Scituate in 1968 with over 2000 QSOs. The state of Rhode Island sold the property circa 1969 and that was the end of that. The old farm house (and FCC WW II monitoring facility) is still there (we operated from tents, of course). The 1968 Field Day results are attached. There is a photo of K1HZN on your web site, circa 1959. I still have the voltmeter shown in the upper right hand corner of the photo, I have no idea how it wound up in my hands! That photo is probably circa 1962. 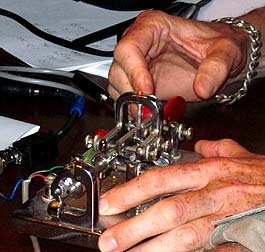 The clues are the Ham-M rotor control (we didn't have that until 1961) and the Hallicrafters HT-32 to John's left. We acquired that transmitter from Msgr Mahoney (call ?) at St. Mary's church circa 1962. 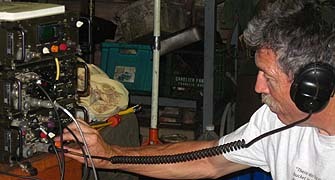 It retired our old W1QLD 807 transmitter that we used in 1961 and 1962 Field Days. Ask John about the 2 element quad I tried to build at Field Day 1962... It wasn't quite as successful as the 1959 quad the SSB guys built to use with their brand new their KWM-1. FIELD DAYS -- Its hard to find a PRA member past or present who doesnt remember Field Day or the many stories associated with Field Day. Camaraderie has always been a mark of the PRA both inside and outside the club and nothing brings camaraderie out more than Field Day. People and equipment show up from everywhere. Many members who are not otherwise active make it a point to show up for Field Day. Old friendships are renewed, while newer members get introduced to the other members. 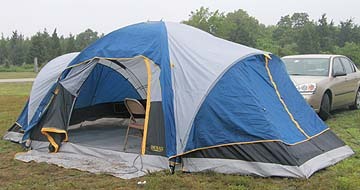 As in past years Field Day was an event with people coming out of the woodwork. 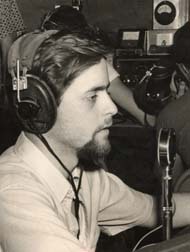 W3LPL (ex-K1LPL) was a participant from 1959 to 1968 while K6LL/7 (ex-K1JYN) one of the prominent US contesters was a regular operator at 1970s Field Days. 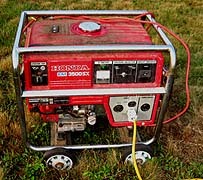 The 1930s participation was with low power (less than 20 watts) and in many cases homebrew equipment. 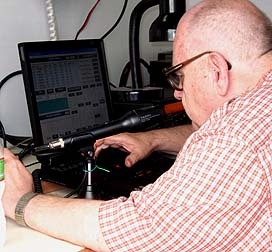 The PRA continued over the years to improve its Field Day results from the 23 QSOs and 522 points in 1939 to 404 QSOs in 1959 by 15 operators using 2 transmitters (running less than 30 watts) totaling a score of 3861 points. By 1989 operating 2A with a novice station the clubs 15 operators amassed 2167 QSOs for 6076 points for 28th place out of 532 entries in the 2A class. Every year brings new Field Day activity, in 1970 the club participated with 10 members from the Boy Scout Reservation in Cranston with 10 members in attendance . Rigs are always front and center at Field days with quite an assortment of stuff. In 1959 there was a KWM1 and National NC300 and a Johnson Viking II, while the early 60s bought a W1QLD homebrew 807 transmitter and a National NC-303 receiver and a Hallicrafters HT-32 transmitter. In the 1970s everything from Heathkits to Collins S-Lines (the top of the line radio of the period) could be found in the PRA Field Day tents. 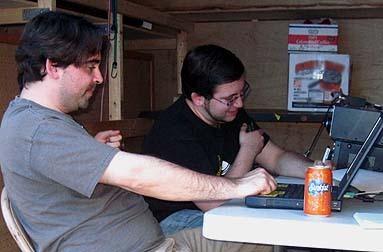 Through the ingenuity of some members who were students at Rensellear Polytechnic Institute we also had our own dial up phone system between operating tents. Field Day stories abound, from the strange antennas, to the strange goings on. Over the years 80 meter 2 half waves in phase to full sized 2 element 40 M quads have shown up at Field Day. Who can forget W1YNEs late night arrival and driving into a ditch which required a stop in activities for the whole crew to push Gordons car out of the ditch. Another memory is K1JYNs (now K6LL) headphone mounted speakers laying on top of the rig while he operated at 2 AM, keeping the neighboring Boy Scout troop up all night with the sweet sounds of CW (at least to us). 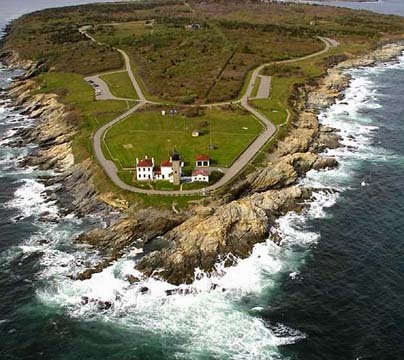 Over the past 30 years most of the PRAs Field Day participation has revolved around Beavertail Point in Jamestown. The story of the PRA use of the Jamestown site is recalled by K1DT. 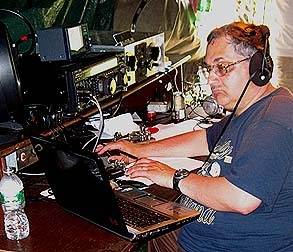 In 1975, after holding some very FB field days at the Champlin Reservation in Cranston, the Highland Rod and Gun Club in Foster and K1JNJ's QTH in Harmony, the PRA membership became extremely enamored with the idea of getting permission to use the site of sites, the abandoned US Navy transmitting station at Beavertail Point, in Jamestown. Every ham of the day had driven down to the southern tip of Jamestown peninsula to look in awe over the hundreds of acres of massive HF antennas. A row of 3 giant rotatable Collins 6-40MHz Log Periodic Dipole Arrays, half dozen huge 2-30 MHZ inverted discones each supported by a circle of ten 100 foot telephone poles, dozens of "smaller" 6-30MHz conical monopoles, an impressive 2-30MHz fixed wire log periodic supported by a pair of 130 foot towers was located on the west side of the peninsula, and on the east side was the Massive 600ft "NORD" vertical. US Navy personnel at the guard shack made sure no one was to enter. In the middle of the peninsula stood Ft. Burnside and it's two radar towers where the Navy Reserve would regularly exercise. I remember going by as a young boy on a Sunday drive with my parents and being amazed at it all. My parents didn't understand it all and couldn't figure out why the AM car radio was filled with strange noises. We had driven down to take a look at a small airplane which managed to crash and get tangled up in one of the inverted discones, and for my dad and I to go fishing off the rocks. What I really wanted to catch was a peek inside that radio station! Well, as happens with technology and government, things become obsolete, and this is what happened to the US Navy Beavertail Point Transmitting Station in the 70s. The station went dark and all personnel were vacated except for the MPs who guarded it. In typical Rhode Island fashion, one of the PRA members had a friend who knew the Commander at the Naval Education and Training Command in Newport that had control over the decommissioned station. 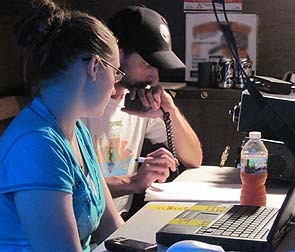 On a long shot, a proposal was drafted asking for our permission to operate Field Day on the grounds of the transmitting facility. To the amazement and joy of the membership, the permission was granted. We were strictly forbidden to keep away from the Ft. Burnside facility. We were reeling with joy. This was the Mecca of all radio locations in the area. We were to be surrounded by salt water for 270 degrees, and the entire facility was covered in ground screen. Our dipoles and tri-band beams would play like never before. It was to be a field day like no other. Much planning and many reconnaissance missions were made to the site to determine what antennas we would erect and where. It was unlikely we could use any existing antennas, but we were prepared either way just in case. Brown, WA1NZR, a Jamestown local, had been contracted by the Navy to maintain the aviation beacons on the two 130 foot towers that had supported the now gone horizontal wire LP. He assured us it would be no problem to erect a wire between them for just one day, and being a mile form the main facility, it would be invisible. This would be the location of the CW station. We would locate the phone station by the main transmitting facility and use traditional dipoles and a tri-bander, and maybe hook into something big. Finally the day came. We were greeted at the gate by the guard who checked all the papers, took all our names, license plate numbers, gave us all the rules and watched over most of our activities. We asked permission if we could use some of the towers as supports for our wires. The best we could get was a reluctant approval to attach to an old TV antenna mast on the chimney of the generator building. We were on our best behavior as we were indeed operating on active US military property and the MP had a gun, so we played by the rules. The station was not operational but still 97% intact, the exceptions being the horizontal LP and the 600ft NORD antenna being deemed aviation hazards and taken down. A mile away at the southern end of the property, down the many overgrown and meandering service roads is where John, K1HZN, established the CW camp, in the shadow of the 130 foot towers left from the horizontal wire LP. Navy reservists were on maneuvers at the adjacent Ft. Burnside property but we kept away from each other. 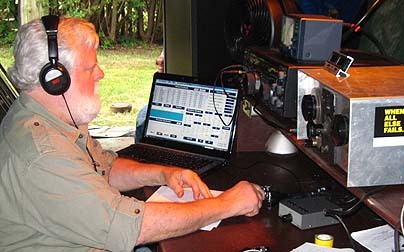 K1HZN fashioned a full size 40 meter lazy H, inspired by Chuck Ashworth, W1BIS. Dave, WA1QOG, and Brown, WA1NZR, climbed the two towers and hung the Lazy H. It was a magnificent sight. The antenna performed wonderfully; with the one unanticipated issue that it collected many KV of wind static. The static charge was so great that the plates of the antenna tuning air variable cap would arc over, and the Teflon insulation of the 4:1 balun was puncturing. We eventually fashioned a static drain choke, but not after receiving several nasty bites of the monster. No one ever had this kind of issue with their backyard 40-meter dipole! We also had the help of Steve, K1KEC, who supplied us power from his 3 cylinder Kohler generator, brought along his Drake TR6 station and Johnson Thunderbolt amplifier and Roger, K1CZH (Now W1OJ). 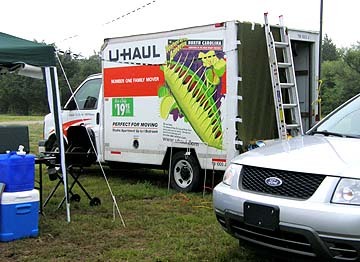 Operating from K1HZNs tent trailer, we amazed onlookers with the performance of the station, half powered by generator and the half by Genesee Cream Ale. 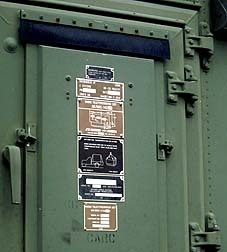 Brown provided shuttle transportation between the stations via his Navy issue M-38 (or M-151?) Jeep. All in all, it was an amazing field day. Indeed, our dipoles and tri-bander worked like never before, but compared to what we were surrounded by, our antennas looked comical. 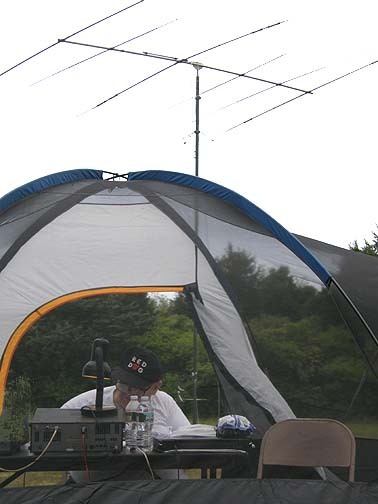 At the end of the Field Day, we all commented that what we Really wanted was someday to actually use the existing massive antennas, and we fantasized about what kind of commanding signals we would put on the bands with them. The next year, 1976, we again were granted permission. There was even more excitement, and of course, everyone wanted to get in on the excitement. We had no problem rounding up operators and volunteers for this Field Day! 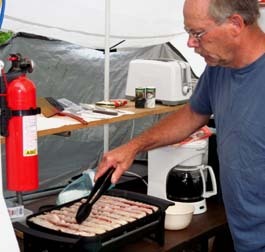 Joe, WA1TAQ, was so excited to operate that he took his new bride of less than an hour and spent their first honeymoon evening in a tent at the base of a log periodic operating 20 meters phone! When we arrived however, we found things quite different. The guard was still there, but he wasn't as concerned with our being there. The appearance of the place had deteriorated, there being little or no maintenance to the grounds or antennas. Some of the antennas showed obvious signs of damage form the elements, especially the 3 rotatable Log Periodics. We were allowed, or should I say we weren't prohibited, to use the antennas, and that we most certainly did. A tribander for the first phone station was set up on top of the operations building and performed great. 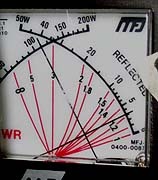 The first experiment was by Bob, W1IMM, and Glenn, K1GDS, who took a length of RG58 from a rig and clip leaded it to the 5-inch coaxial flange of one of the log periodics. Results were amazing, with the antenna pointed in the wrong direction! Being electrical engineers, the rotator control box was opened and the relay logic analyzed. With the aid of another clip lead and a screwdriver jammed into a relay, the drive motor was energized and the antenna began to rotate. And not just the antenna, but also the 80 foot 12 inch diameter supporting mast rotated along with it. It was a sight to be seen. The second phone station operated here on 40 meters where a string of VKs was worked reporting that we were an amazing 599+ down under. The same Lazy H was used down at the CW station. With 1976 being the US Bicentennial, there was much activity to be seen from Beavertail, including a procession of tall ships. WA1QOG was atop one 130 ft tower as the Good Year blimp flew by with passengers waving to him. 1977 found things different again. There was more deterioration at the site. There was no permanent guard, he met us at the gate and then he left. The site had been overrun and illegal scavengers for scrap had pulled many of the extensive underground copper feedlines up. The main building was empty and litter had taken the place of the transmitters in their bays. Most of the antennas were still up. This year we were going all out. Zaven, W1IUX, constructed a full size 80 meter Bobtail Curtain, and strung it between two of the 100ft poles of the inverted discones. 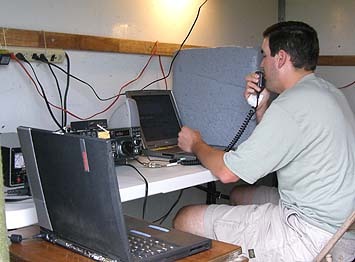 Harry, K1JNJ, connected his National NCX-1000 directly to one of the massive inverted discones. 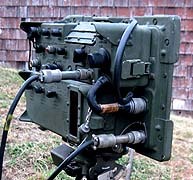 Two of the rotatable LPs were used. We were working stations like never before, and then came the thunderstorm of all thunderstorms. There we were, all connected to the end of massive antennas. Feedlines were disconnected and we all huddled, as the heavens broke open above us. The lightning was incredible and lasted for hours. There were several direct strikes to the facility. The ground shook, it was like a war zone. We drove around in the pouring rain checking on everyone. Then we came upon Harry, K1JNJ, still in his van at the base of the discone, looking at the charred remains of his prize National NCX-1000. He was having such a run on 80m phone and so much fun that he continued operating through the storm until his antenna took a direct hit. 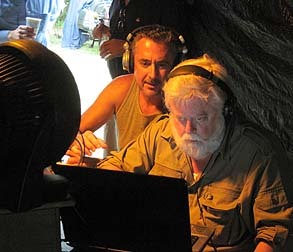 Harry, now SK, spent the next 20 some years trying to repair that rig. 1977 also brought upon some other changes. The Navy had pulled out and the entire facility was handed over to the State of RI with plans for it to become a state park, with the exception of the Ft. Burnside property, which was to be retained for possible further use. That year saw the demise of much of the facility. We continued to operate there with the permission of the State of RI, Dept of Environmental Management, Parks and Recreation, until 1981, when all the antennas and towers were demolished. We were saddened to visit and see the three rotatable log periodics fallen in the grass, overgrown with brush and being scavenged for aluminum tent poles and fishing outriggers. An effort was begun to salvage one of them, but this is yet another story. 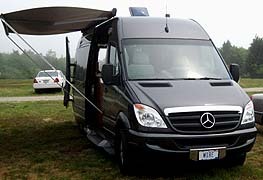 In 1982, our permission was not granted, due to the construction of the Beavertail State park, so we operated out of a muddy field at the Victory Sportsman Club in W.Glocester. There was hardly any enthusiasm after the past 6 years at Beavertail. We were determined to get back down there. Due to his prior dealings with the Navy, Brown, WA1NZR, had arranged with them and the State to become the caretaker of the Ft. Burnside property. Just like the transmitting station, "The Bunker" as we called it, had also been subject to vandalism and deterioration from the elements, and the authorities we happy to have someone like Brown watching over and tidying up the place. 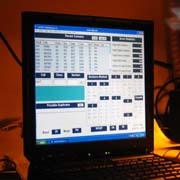 Hi Guys, Thanks for including me in the group seeing the FD Blog for W1OP. My first FD with the PRA was probably 1955 --- I was licensed as WN1HIJ in 54 and moved to general sometime in 55. All the names are of course familiar to me, but I moved from New England in 68 and haven't been back to live since except for a brief stint in Boston in 81 and 82. As John Good said, in recent years, I've been doing Field Day with a small group of people (8 or 9) in various places around the world. 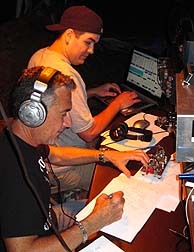 We are "chartered" as the Pina Colada Contest Club (KP2AA) and we did FD from Puerto Rico (as NP4A) in 2002, from outside Havana Cuba as CO0US and T42FD in 2003, as KP2AA in 2004 and 2005. 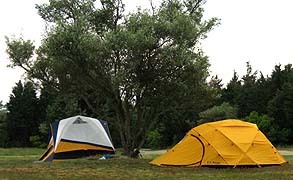 Hi Vic, this is Page, WA3EOP, one of the US Islands Awards Committee. Any way wanted to let you know (and you will find photos at the USIslands.org) that me and Al KZ3AB motored up your way and operated from beside the lighthouse (and with park permission after dusk) for one day and it was really exciting. 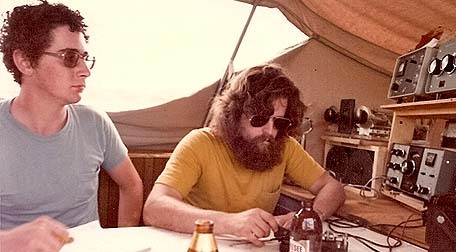 (3 or 4 years ago) Because we were IOTA/Lighthouse and US Island combined we got spotted by a DX Cluster and we had a nice opening to Europe on 20 for a couple hours.A HUGE PILEUP from ITALY AND some other Europeans and we were only running 50 watts to a mobile antenna. Great fun while it lasted. And we had N1L (Number 1 Lighthouse) to use for the day. Any day without contesting you can make a couple hundred contacts from a mobile is a good day. Its a nicequiet spot if you don't mind the soft foghorn! I'd like to go back there again sometime and the park ranger and the folks of the lighthouse society were real welcoming.